This is a 2011 Volt with 24,000 miles and it has been driven in EV 99.8% of the time. Wow, all but 38 miles were powered by the batteries. The obvious question is why does this person have a Volt instead of a Nissan Leaf or similar pure EV? Well, I have not asked him, but maybe he likes the Chevy brand, or even though nearly all of their driving is on electric, they are not ready to give up the safetynet of the gasoline back up until the infrastructure is more widely deployed. Whatever the reason, the goal is to having personal transportation powered efficiently and cleanly. Google's 2013 Zeitgeist is out. It is a telling annual breakdown of our collective interests. There are lists for all kinds of things. Among the lists are hybrid and EVs searches. Of course, all the usual plug-in players appear on those lists. This year, however, there was something I have not seen before: Plug-in cars top two of Google's general automobile trending lists. 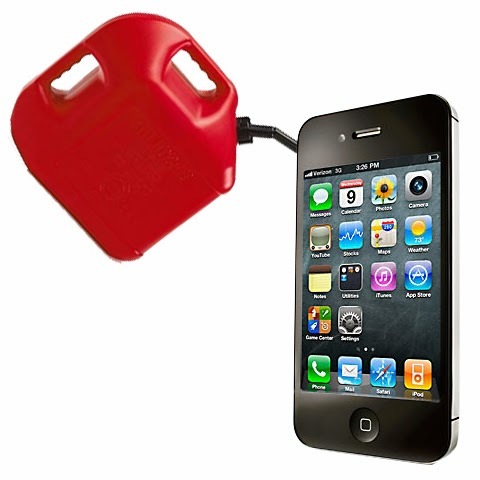 In the ad (spoiler alert) they say that the energy in a gallon of gasoline could run your smartphone for 3000 days. How great would that be? A phone that I didn't have to charge for 8 years! A gallon of gas would be a lot to carry around, but I would be happy with a smartphone that I only had to recharge refill once a week. According to Exxon's 3000 days for 1 gallon math, a week would be possible with less than half an ounce of gas. So why aren't we all doing this? So let's examine this a little more. They didn't mention pollution, environmental impacts, foreign wars, or other issues. These are important, but they only talked about energy, so I'll do the same here. Since they are talking about running electronic devices with gas, let's see how much energy gasoline has in kilowatt-hours(kWh), since these are the units of energy that run smartphones and other electronic devices. Depending on the summer or winter blend, a gallon of gas has between 33 and 33.6 kWh of energy. Let's be generous and use the higher of the two values. Ok, it is obvious that Exxon is not truly suggesting that smartphones run on gasoline. Reading the subtext, this is really a jab at alternative fuels and specifically electric vehicles (EV) on the market today. 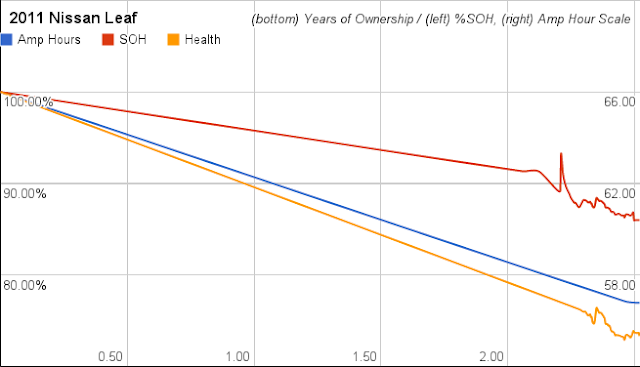 So let's cut to the chase and compare vehicle fuels. Let's say you have 1 gallon of gas compared to its energy equivalent of a 33.6kWh battery pack. Depending on the fuel efficiency of the car that one gallon of gas will get you from 18 to 60 miles. The average fuel economy for new cars sold in 2012 (the latest year with current data) was 23.6 miles per gallon on average. So a gallon of gas will, on average, get you less than 24 miles. Now let's put that one gallon of energy (33.6kWh) in an EV. The EPA rates the 2013 Nissan Leaf at 3.45 miles per kWh (although I consistently get over 4). So, using the EPA numbers, this "one gallon" of energy would get you 115 miles. There you have it, the electric car will get you more than 4 times farther on a "gallon" of energy. That concludes cars, let go back and finish the smartphone case. Exxon does not mention the efficiency of converting gasoline to electricity to run that smart phone. They don't mention that running something like a portable generator would mean that most of the energy in that one gallon would be lost as heat or go out unburned in the exhaust. Looking at the spec sheet for a Honda portable generator, it is between ~13% and ~18% efficient depending on load. 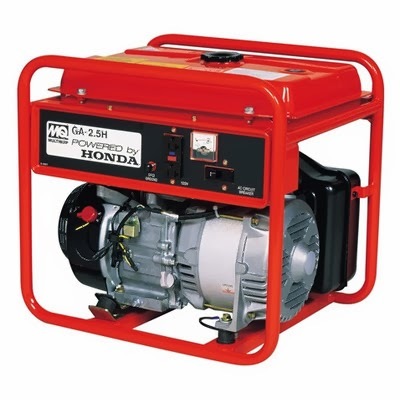 At peak efficiency, the 6kW Honda generator I looked at will produce 6.13kWh per gallon of gas. For completeness: the worst-case was 4.42kWh, and the median was 5.7kWh. So now let's take another look at Exxon's claim. They said if you could use all the energy in that one gallon of gas, it would run your phone for 3000 days. Well, we cannot extract all of the energy, despite more than 100 years in engine research and advancements. Using the median value of 5.7kWh of my example generator, that gallon of gas only has enough usable energy to run your smartphone for 500 days. Not bad, but you'd have to drag a gallon of gas and a generator around with you. Whereas if you were to power your smartphone by charging it in your electric car, other than some minor losses from power converters and self-discharge, you would get nearly all of the energy back and truly be able to power your phone for thousands of days. Is There a Viable Fee-Charging EV Recharging Business Model? Car Charging group had only $40K in revenue from 679 EV chargers and lost $6 million dollars in the last three months. Maybe Tesla and ad-based Volta Charging have it right. My Nissan Leaf Forum • View topic - Leaf Spy and Leaf Spy Pro (previously Leaf Battery App): "Yes, the lower Wh figure per GID is to reflect usable battery capacity. The 80 Wh are stored energy, which is also what most of the instruments index. This is because it's difficult to estimate battery losses upfront. That depends on the discharge current and vehicle speed, among other things. When you multiply 281 GID by 77.5 Wh, you will get 21,777.5 kWh of usable capacity. It's worth noting that the last four or five GIDs are not accessible to us, which leaves us with 21,390 kWh. That's a very close match to 21,381 kWh NREL has determined in their tear-down analysis. Drivers typically use 21 kWh as the standard figure for usable capacity, which can be multiplied with energy economy for range prediction." EIA Foresees Fossil-Fueled Future for Transportation Navigant Research: "The U.S. Energy Information Administration (EIA) released an early version of its Annual Energy Outlook (AEO) for 2014, depicting an energy future overwhelmingly shaped by the development of new oil and natural gas reserves. Cumulative production of natural gas from 2012 to 2040 in the AEO2014 report is about 11% higher than in AEO2013, reflecting the continued growth in shale gas production from increased horizontal drilling and hydraulic fracturing." The Tesla battery swap is the hoax of the year | Watts Up With That? The Tesla battery swap is the hoax of the year | Watts Up With That? : "fifteen months after Tesla started getting carbon credits for the battery swap. The company has already cashed out, probably for more than $60 million. Without building a single swap station, or demonstrating the feature in consumer cars, or bothering to provide any sort of explanation. I have emailed them, written on their Facebook page, posted in their forum. Their only “reaction” was to kinda make the battery swap disappear from their website. It’s impossible to get an actual response from the company. Tesla intends to shut up its way out of this mess. The question is, how could a scam so brazen go unnoticed for so long?" Electric Avenue is a one block stretch of SW Montgomery St in Portland, Oregon that is covered with EV charging stations. It is flanked with CHAdeMO fast chargers on each end. There are eight car parking spots and Level 2 charging stations (the standard for modern EVs) populate the other 6 spots. Additionally there is a standard household outlet (Level 1) in the center area with bicycle parking where you can plug in your ebike. This area is part of a 3 year study of charging habits and usage patterns. The project is currently 2 years old. Buy your parking sticker at the tall green SmartMeter pay station, display the receipt in your driver-side window (because this is angle-parking). Electric Avenue is located in downtown Portland; downtown parking meters operate from 8am to 7pm, Mon thru Sat, and from 1pm to 7pm on Sun, unless otherwise posted; except for meter holidays. The current rate for on-street parking in the Downtown district, including Electric Avenue, is $1.60 per hour. The two fast chargers, Eaton Level 3 and Kanematsu, do not require memberships, but you will need to interact with the charger screen and/or physical button on the machine -- follow the on-screen instructions to activate charging or to stop charging. OpConnect (the short green machine) requires that you interact with the charger's screen -- when you plug in, your car will beep like it's charging, but this is just a 5-minute interim charge session; you need to then select from bottom of the charger screen which PORT you are using (either 1, 2, 3, or 4); then swipe your membership card -OR- enter your email address on the screen. If you don't swipe card/enter email, the charger will only run for five minutes, and then shut off. The GE, Shorepower, Eaton Level 2 and SPX chargers are all plug and play (plug car in and you're done). This June 2012 schematic shows where on Electric Avenue the Level 1, Level 2, and Level 3 chargers are located. Drive an EV for less than your monthly gas payment. There is an offer on smart ED cars in Portland. 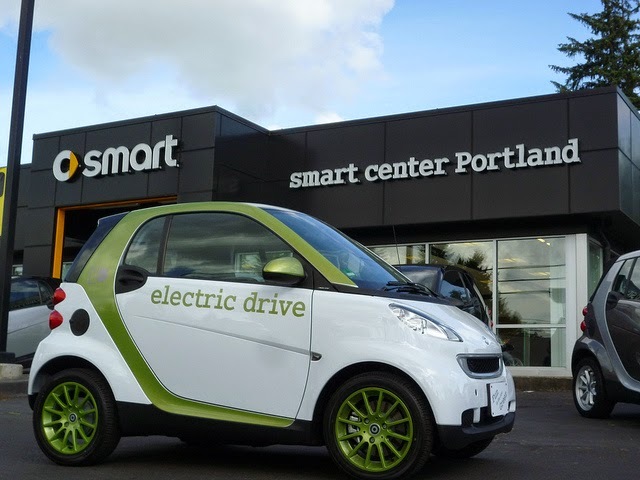 Oregon Electric Vehicle Association (OEVA) members can get a 36 month lease on the new smart electric drive for $155/month (total including down payment and battery lease!) from the smart center of Portland. 81% of Electric Vehicle Charging is Done at Home: "The initial findings from a survey of 3,247 individuals conducted by PlugInsights show that 81 percent of electric vehicle charging occurs at home. Of course it does. The remaining 2% of charging presumably occurs at some unlisted location like, perhaps, Area 57. These findings would seem to suggest that public and workplace charging aren’t necessary, but we know that not to be true. 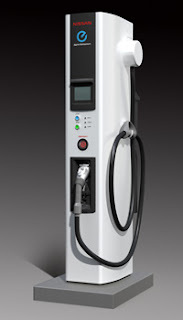 At home, public and workplace charging are all essential for the growth of the EV segment. Even if 99% of charging occurred at home, public and workplace chargers would still be useful and beneficial to the cause of increasing EV adoption." A friend of a friend recently bought an EV and wanted to know what to buy for home charging. They asked me via email. Since I didn't know the person, nor their specific situation, I wrote some general guidelines to picking out a home charging station that might help you, a friend (or a friend of a friend). One, the charger is onboard your car. 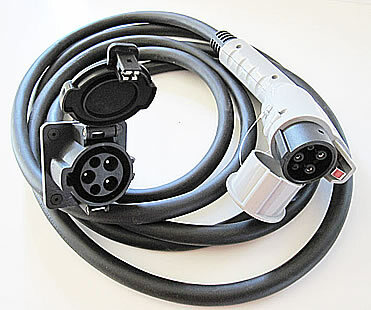 The charging station that you plug into your car is just a way to safely deliver power with a standard connector. That is why you will occasionally see charging stations referred to by their technical name of electric vehicle supply equipment (EVSE). Two, charging stations are rated by how much power they can deliver. Similarly, the onboard charger has a power limit. These limits are rated in kilowatts (kW). How fast your car charges is based on whichever is lower, the car's onboard charger or the charging station, so you'll want a home charger that is well matched to your car or your needs. Note: I live in the US, so this will be US focused. If you just bought a Tesla Model S, congratulations, and they have service reps that can help you with this decision, so I'll assume you bought a Leaf, Volt, Spark, or one of the many other plug-in cars that are now on sale. Most new plug-in cars come with a Level 1 supply unit a.k.a. a "trickle charger". For some people, these alone are adequate. They plug in to any standard home outlet. They charge your car slowly, but they are easy to use and don't cost you anything extra. At a mere 1.3kW, they generally only give you 4-5 miles of range per hour, so they work well for overnight charging but don't expect to be able to drive to near empty in the AM and have a full charge after lunch. For a plug-in hybrid such as the Volt, Plug-in Prius, or Ford C-MAX Energi this could be enough. For a 100% battery electric such as the Leaf or Ford Focus Electric, this is not my preference due to the slow charging rate. Whereas the trickle charger plugs into a standard home outlet, a portable Level 2 supply plugs into a 240 Volt outlet such as a dryer plug. Portable chargers are nice since you can take them with you on the road. You can charge up at campsites and I have thrown a cord out of my brother-in-law's laundry room window when I needed to charge up. This option is ~$550 and you'll need a 240V outlet in your garage. If you don't already have a 240V outlet, it is generally less than $400 to have an electrician install one or you can do it yourself if you are handy that way. At 4.8kW, this will give you a max of 18 miles of range per hour that you're plugged in. Option 2 is to have your trickle charger upgraded at evseupgrade.com. Depending on the charger you have, the upgrade prices vary, they are generally $250 - $300. The nice thing about this option is that you can buy adapters so you can use it at various types of 240V outlets (RV, dryers, welders...) and 120V outlets. The third option is a wall mounted unit. If you want advanced features such as timers, Internet connectivity, or energy reports, then this is your category. These are typically installed in your garage, carport, or wherever your car is usually parked for the night. They have the advantage of always being in the same place. It is highly unlikely that you'll pull into your own garage to find out that it has been borrowed by your neighbor for a cross-state EV road trip. You can find many options for these at Amazon.com or Home Depot online. Just search for "EVSE". The prices range from ~$500 to over $2000 plus installation. Once installed, these are the most convenient to use. The two most important features to consider are the cord length and the power rating. There are options at 3.8kW, 7.2kW, 7.7kW, 9.6kW. Each 1kW will give you about 4 miles of range per hour. Remember, a power rating above the level of the car's onboard charger does not do anything for you. Assuming the car has a 6.6kW charger, a 6.6+kW unit will give you about 25 miles of range per hour. The final option I'll offer is the home-brew maker option. There are Arduino-based and Kickstarter some-assembly-required charging stations. If you are the hobbyist type, you might consider one of these and I'll leave you on your own to investigate them. For me, I have a combination. At home I have a wall mounted Level 2. This makes it easy to charge up each night. Additionally, I have an EVSEUpgrade.com unit with 6 or 7 adaptors. These adaptors allow me to me to use nearly any outlet I may encounter. With the proliferation of public charging in the greater Portland area, this normally goes unused. It sits in my car's cargo area as a bit of assurance. I hope this helps you understand the options and make a choice that works for you! Plug-in vehicle (PEV) sales in the US have passed the 150,000 mark according to Plug In America’s sales counter. It was just in May of this year when we passed the 100,000 milestone. The lucky owner of that vehicle was a Mitsubishi i-MiEV driver in Alabama. Now (just 6 months later) the 150,000th car with a cord has hit the roads. There is no word on who bought the 150,000th car or what or which model was. 2013 is likely to double the number of PEVs on the road. This continued rapid growth in sales and available vehicle models looks to be a tipping point for plug-in vehicles. This rapid growth will soon accelerate them from niche vehicles to significant market share. In 2014, new plug-in vehicles models are coming from BMW, Volkswagen, Volvo and others. These vehicles will make more people aware of plug-in vehicles and the exponential growth of sales will likely continue after we ring in the new year. I love driving my Nissan Leaf. It is my goto vehicle for commuting, errands, and other around town trips. Using the West Coast Electric Highway, I have even made 200 mile roundtrips in it. Yet, it is not the only car that I drive. Occasionally, I need to travel a long distance and it doesn't happen to be on a "wired highway". For these rare holiday trips, it would be nice to be able to take my Leaf. The ‘EP Tender’ would allow me to do just that. It is a small generator and fuel tank mounted on a trailer. It is made by a French company and available for rent when needed. The range extender allows an EV such as the Renault Zoe or Nissan Leaf to drive for an additional 300 miles and to fill-up at any gas station. 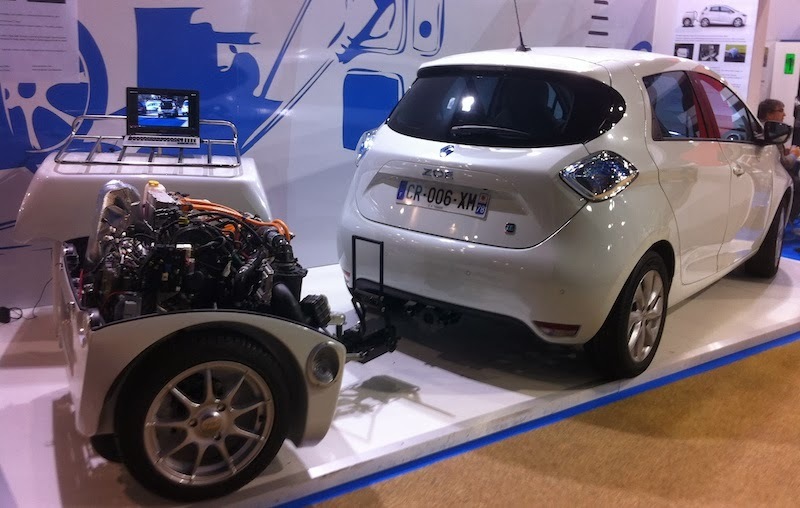 The trailer contains a two cylinder engine that runs an efficient turbine that creates enough power to keep the car humming along. A remote control allows you to selectively enable the generator, so you can either use it when the car's battery is nearly depleted, or you can start the generator immediately and arrive with a full battery pack to use at your destination. And because you rent the trailer, they handle all of the maintenance associated with internal combustion engines that electric car drivers obviously don't want to be bothered with. I hope these are available in the US soon. And hey, EP Tender, if you are looking a beta tester, drop me a line. 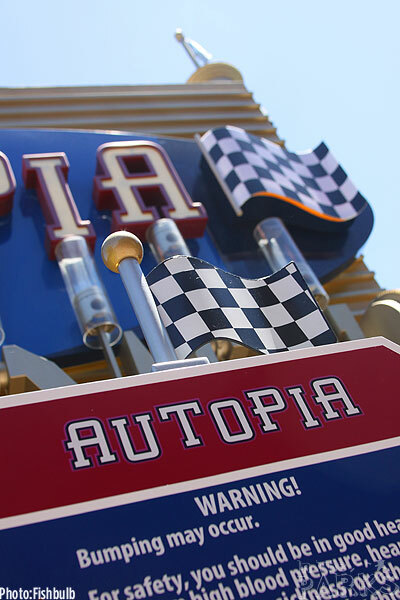 If you have not heard, the Chevron sponsorship of Autopia has officially ended. But instead of renewing, Disney let the agreement go. Why? We will get to that in a minute. But here are shots from the ride, Chevron-less." "Shifting to electric vehicles will also keep more transportation dollars in-state, boosting the economy and creating new jobs." "A recent MIT study found that traffic pollution causes almost 6,000 premature mortalities annually in California, almost twice the number killed in traffic accidents." "Over-reliance on fossil fuel is threatening the health of our families and communities,” said Bill Gallegos, executive director of Communities for a Better Environment. “By expanding the market for zero emission technologies and green infrastructure for transportation, charging and manufacturing, we can make significant improvements to our air quality as well as provide sustainable job opportunities..."
"Californians spend $70 billion on gasoline and diesel annually, $40 billion of which leaves the state in payments to oil companies and foreign oil producing countries. The use of electricity as a transportation fuel can help keep those dollars in the state, stimulating the economy, and insulating family budgets from gas price spikes. Filling California’s cars, trucks and buses with electricity instead of oil would help grow the state’s economy, creating up to 100,000 additional jobs by 2030." "Automakers are beginning to bring a diversity of advanced electric drive vehicles to the market, which don’t rely on gasoline and appeal to families across the income spectrum. Most automakers today are either selling or making zero-polluting cars for sale within the next few years." H2 Energy Outlook: How Many Miracles? Energy Outlook: How Many Miracles? 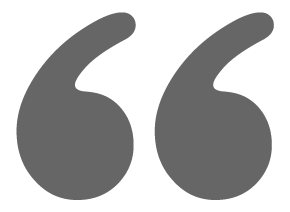 : "
Over the weekend I was catching up on articles, and one from Technology Review last week caught my attention. It was a brief interview with the new Secretary of Energy, Dr. Chu, covering nuclear power and fuel cells. In the back half, Secretary Chu explained why the DOE has cut funding for hydrogen fuel cell R&D, suggesting that fuel cell cars were always a long shot, because they required "four miracles" to happen. Although I haven't mentioned fuel cells very frequently here in the last few years, I must say it's hard for me to consider the commercialization of something that I've already driven as requiring quite so many miracles as that. At the same time, I don't trivialize the obstacles that explain why fuel cell cars are still not available in large numbers, despite previous expectations--including my own--that they would be by now." Will Too Many Plugged In EVs Crash The Grid In The Future? People only buy them because they are subsidized, once the tax credits go away, so will the cars." Alternating current - Wikipedia: "The first alternator to produce alternating current was a dynamo electric generator based on Michael Faraday's principles constructed by the French instrument maker Hippolyte Pixii in 1832." Plugin...Recharge! : Electric Vehicle Supply Equipment (EVSE) Vendors/Manufacturers: "
Supportive Government Policies Stimulate Electric Vehicle Market in Turkey, Finds Frost & Sullivan - KPTV - FOX 12: "Turkey is set for the era of electric vehicles (EVs), as original equipment manufacturers (OEMs) prepare for the launch of new EVs and the development of charging infrastructure gathers pace. EV market growth in the country is mainly driven by reduced special consumption taxes (SCT) for EVs as well as demand from global companies that are increasingly focusing on green policies." Solar-Powered Electric Vehicles: Panacea Or Hype? [Tesla Motors Inc, SolarCity Corp, Car Charging Group Inc] - Seeking Alpha: "The ability to harness the sun does, however, contribute to an unparalleled value proposition for the EV that its rivals cannot match." In 2011, I took a leap of faith. After spending more than a year on the waiting list, I bought a brand new, 100% electric car. This was the first new car that I had ever bought. I considered leasing it so I could walk away if the technology turned out to be less than I hoped. However, I don't like leases and after driving electric for the 4 previous years, I knew EVs had great potential, so I paid cash on the barrel-head and became the owner of a new electric car on May 18th 2011. Two and a half years later, I still love the car. It still has all 12 bars of capacity and the range has not diminished. I plan to keep the car for 10 years, so maintaining battery health is important to me. So I generally avoid quick charging and I have the car in "Long Battery Life" mode so that it only charges up to 80%. Even with these precautions, batteries will degrade slowly with the passage of time. I recently started running a program called Leaf Spy that, along with a cheap ELM from Amazon, allows me to read messages from the car's CAN bus. This shows a lot of data. Among this data is the current capacity and health of the batteries. For purposes of the chart, I made the assumption that the car started out at 100% capacity and health. I was surprised to see how much the capacity changes with the weather and use. The spike in capacity occurred when my car received a firmware update in the later summer of 2013. This chart will be interesting once there are multiple years worth of data, where seasonal changes and longer term trends can be seen. EV Futures: Electric dreams - from nightmare to nirvana - SkiddMark: "Jaguar, Porsche, Ferrari, Audi and BMW will all release the most jaw-dropping beauties that will give the most ardent of petrol heads a bad case of ‘electric dreams’ – destroying the illusion for ever that EVs are little more than a ‘sensible’ form of sustainable transport." Oil rises 1 percent on doubt for Syria solution - Yahoo Finance: "Syria is not a major oil producer, but oil traders say the possibility of a wider conflict could interrupt production and shipping routes in the Middle East and cause prices to rise." In other new, electricity prices remain stable. Minnesota faces a bumpy road in trying to fund transportation needs | MinnPost: "major sources of transportation funding, though the gasoline tax base admittedly is eroding as vehicles become more fuel efficient and electric cars become more prevalent. Meanwhile, the cost of labor and building materials is rising, adding to the funding gap." "Encouraging the use of electric vehicles, that's one piece of the puzzle," she said. "To have the vehicles and to have them available means we have to have charging stations." And more charging stations means less "range anxiety" for owners of electric vehicles, said Mike Salisbury, transportation program analyst for the Southwest Energy Efficiency Project. Electric cars are smooth and quiet, "like an iPad compared to a desktop computer," said Cheryl Loveless, mother of four and owner of an electric vehicle. "People talk about not being able to afford them," he said. "They just don't understand how cheap they are." Tax credits lower the extra cost of buying an electric vehicle. "Once things go electric, they will never go back," Edson said. "It's going to be a revolution." Electric Vehicles Need More Study, Less Emotion - IEEE Spectrum: "According to a 2000 study by the Energy Laboratory at MIT, extraction of the raw materials to build the vehicle makes up just 4 percent of a vehicle’s lifetime carbon footprint, and building it adds another 2 percent." Why the EV market will boom - FierceSmartGrid: "Why the EV market will boom"
Eco-eager automakers hype sustainable wood in cars | The News Journal | delawareonline.com: "Patrick Connor, left, and his brother Ed, look over the interior of the Fisker Karma electric car in Wilmington May 22, 2010"
Everything You Think You Know About Electric Cars Is Wrong: "Just as autos replaced horses en masse once their technological superiority was undeniable, EVs will have to be objectively better than internal-combustion vehicles to justify widespread adoption. There are bound to be some bumps and bankruptcies along the way. After all, more than 1,000 automakers of all sizes were founded between 1896 and the mid-1920s. How many of them are still around?" Fox Reports False Telsa Battery Range Problems | EV.com - Electric Vehicle Authority - News-Reviews: "Elizabeth MacDonald claimed that Tesla Motors and Space X founder Elon Musk “has got to fix the Tesla (Model S) battery–which conks out after 16 miles or about a half-hour of usage.”"
Paul Scott - What is the real TCO of gasoline? Paul Scott I take issue with the study's methodology. Nowhere does this article identify the comparison vehicle. You can't just say the LEAF costs 10% more than a comparable vehicle without telling us what it is. I sell the LEAF and have been driving one since they first came out. This is a very nice car. There isn't any car that is an ideal comparison since there are so many variables to consider. For instance, how would you value the fact that it's extremely quiet and smooth. The Lexus is essentially a quieter and smoother Camry. They share the same platform, but the Lexus is twice the price. Does the fact that a LEAF is quieter and smoother than a Rolls Royce have any bearing on the value of the car? Just as importantly, many of my customers value the fact that they can make the energy for their car from sunlight falling on their roof. This is a big deal and not one single ICE car can make the same claim! Add that no soldier or civilian has ever died in a war over electricity, and you get one of the most powerful aspects of the EV. Many people hold that characteristic in high regard. We are willing to pay more money for these things! So, if you insist on writing these lame articles proclaiming that EVs are in some way "comparable" to another car, you HAVE to tell us what you're comparing to. I believe you are doing a disservice to those good people who care whether they pollute the air, contribute to the need for wars, or give their money to the oil companies. In a recent earnings announcement for Tesla Motors, Elon Musk said that Tesla would demonstrate something that will make their superchargers look slow. “I mentioned that there would be an announcement on June 20... not an announcement... a demonstration,” said Musk. Tesla's superchargers are the fastest, highest-power charging technology on the market today. They are the state of the art. So what could be faster? What could make rapid 20-minute supercharging look positively slow? Most of the twitter-sphere, blogosphere, and autopress seem to agree that Tesla will demonstrate a battery swap station. There are statements like "Tesla will have swap stations like Better Place, but they will have a better business model or make them free." Elon Musk has publicly talked about battery swapping several times. 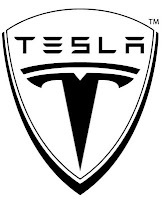 He has said that Tesla may offer an option to rent a high mileage pack for a roadtrips. Something like this would require the ability to swap battery packs but overall his comments about battery swapping have not been glowing. Battery swapping is not a "first principles" solution. 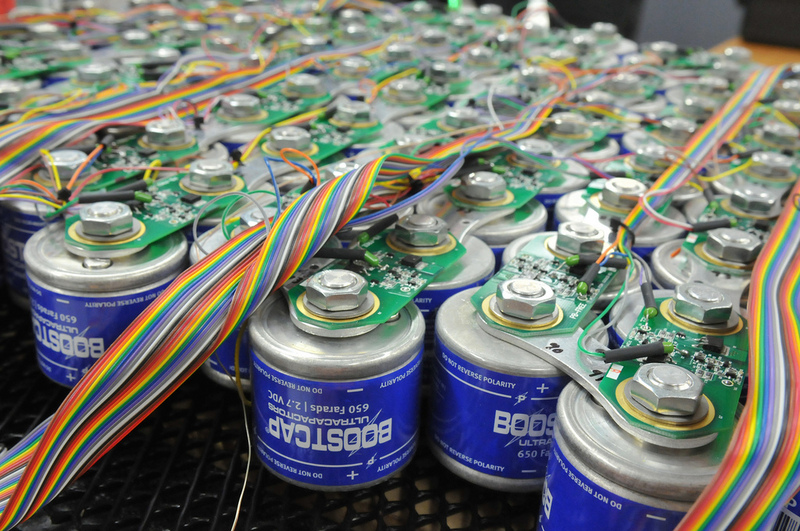 Battery swap stations make an assumption that the current energy storage technology will not advance rapidly. Swap stations workaround batteries recharge time limitation. 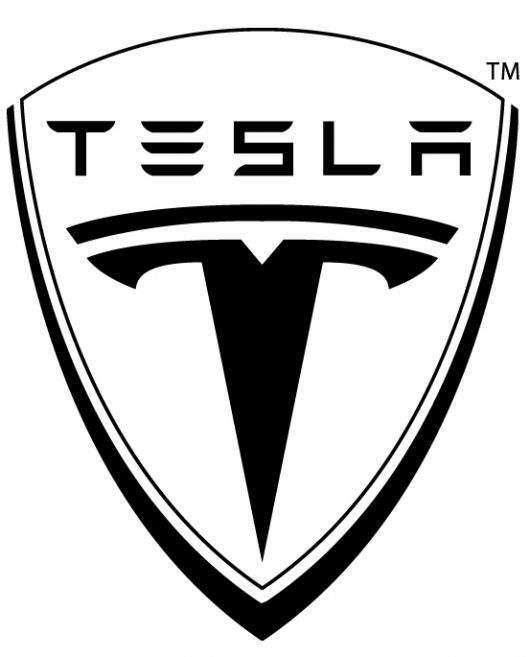 Tesla is not a half-measures workaround type of company. They prefer the pure play. 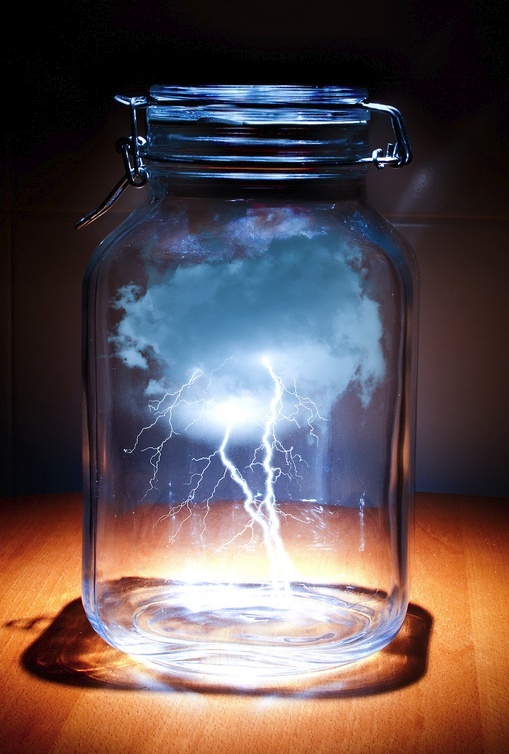 The company is betting on the advancement of energy storage systems. Despite the consensus on of cyberspace, I predict that they will not be showing a swap station on the 20th. It is not an Elon move. I have a different guess as to what Tesla will be showing. I think they will be showing a car that has ultracaps. Why do I think it will be an ultracaps demo? There are hybrid buses on the streets today that use large format ultracaps to store energy from regenerative braking. There are also wind turbines that use ultracaps to smooth out the variable power that intermittent wind can cause. Portland, Oregon's Tri-met recently announced that their light rail trains will be the first in the country to use ultracaps to improve power delivery from the overhead lines. Given that there are many applications using ultracaps on the market today, including transportation uses, I think Tesla has made a prototype EV that has ultracaps rather than (or in addition to) batteries for the energy storage system (ESS). Elon said that the demonstration will make the current Supercharger systems (still being rolled out) look slow. The bottleneck of the current system is not the ability to deliver energy. Delivering more energy may have some logistical problems, but it is not technically difficult. Rather, the limiting factor of recharge time is the ability of the batteries to absorb the energy. Ultracaps have no such limitation. Since ultracaps stores energy in an electric field, rather than in a chemical reaction, they can store the energy as fast as it can be delivered. Given the strategy for both the Tesla Roadster and the Tesla Model S has been to take commercial 18650 form-factor laptop batteries and pack them together for vehicle solutions, ultracaps would be the logical evolution beyond batteries. Ultracaps have several advantages over batteries including charge-time and cycle life. They can survive hundreds of thousands more charge and discharge cycles than a battery can. There have been great strides in graphene supercapacitors recently. Including methods to make them significantly cheaper. Batteries still have several times the energy capacity of ultracaps. 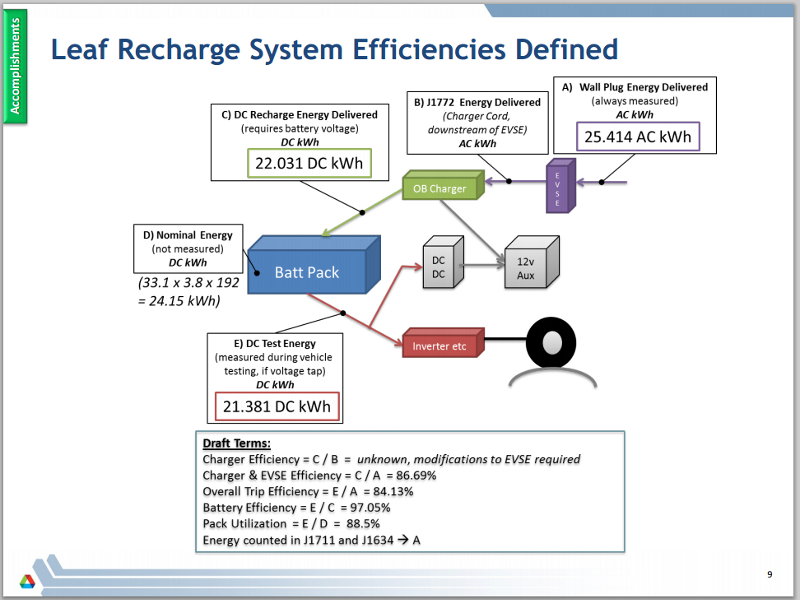 So, if my speculation is correct and the demo is an ultracap car and an ultra-fast supercharger, and a vehicle with either a shorter range than the current production models, or it will be a hybrid energy storage system with both batteries, for range, and ultracaps, for fast charging and improved regen braking energy capture. The Tesla Roadster has 6,831 batteries and the Model S has over 7000 of the 18650 laptop batteries. So, if there is any company out there that knows how to package a large number of little rechargeable devices together in a crash and fire-safe manner, it is Tesla. We'll find out on June 20th! On Thursday, June 13, at 1 PM, Governor Kitzhaber will be joined by representatives from Portland General Electric, Nissan North America, and IBEW will dedicate a new Nissan DC Quick Charging (DCQC) Station and two Blink Level 2 EV charging stations at the State Street entrance of the Oregon State Capitol building in Salem. The site is officially part of the Oregon Electric Highway due to its proximity to US Highway 99 and Oregon Highway 22 and their nearby connections with Interstate 5. The DCQC station was donated by Nissan, with installation donated by IBEW Salem Local 280. You are invited to attend and show your support for additional EV charging in Oregon! New all-solid sulfur-based battery outperforms lithium-ion technology: "The ORNL team overcame these barriers by first synthesizing a never-before-seen class of sulfur-rich materials that conduct ions as well as the lithium metal oxides conventionally used in the battery's cathode. Liang's team then combined the new sulfur-rich cathode and a lithium anode with a solid electrolyte material, also developed at ORNL, to create an energy-dense, all-solid battery. "This game-changing shift from liquid to solid electrolytes eliminates the problem of sulfur dissolution and enables us to deliver on the promise of lithium-sulfur batteries," Liang said. "Our battery design has real potential to reduce cost, increase energy density and improve safety compared with existing lithium-ion technologies."" Tesla recently unveiled a plan for a national (and international) network of solar-powered ‘Superchargers’ – fast charge points which can recharge a Model S’ batteries to 80 per cent full in about 30 minutes. Now that’s far longer than it takes to refill a conventional fuel tank, so what does Musk have up his sleeve? All he will reveal so far is that it’s “part of a mystery announcement. Part five of the trilogy.”"
EV Myths Debunked: "Electric cars are as green as their juice Critics of electric cars love to talk about manufacturing emissions and putting horses before carts. But they never seem to offer any better solutions. If they were waxing lyrical about urban densification, electrified public transport and the joys of bicycles their critiques would ring true, but that’s not what you hear." A portable device should be turned off while charging. This allows the battery to reach the threshold voltage unhindered and reflects the correct saturation current responsible to terminate the charge. A parasitic load confuses the charger. Charge at a moderate temperature. Do not charge below freezing. Lithium-ion does not need to be fully charged; a partial charge is better. Chargers use different methods for “ready” indication. The light signal may not always indicate a full charge. Discontinue using charger and/or battery if the battery gets excessively warm. Before prolonged storage, apply some charge to bring the pack to about half charge. 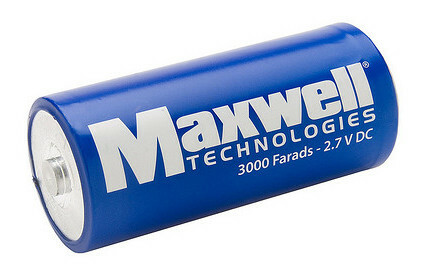 Over-discharged batteries can be “boosted” to life again. Discard pack if the voltage does not rise to a normal level within a minute while on boost. "